The Aikido International Club is a club whose purpose is to promote budo and friendship across international boundaries. The club intends to do this by establishing cross cultural dialogue and training between the members of many nations who desire to maintain the vision and standards of the Founder of Aikido, Morihei Ueshiba, the current Doshu of Aikido, Moriteru Ueshiba, and Aikido World Headquarters, the Aikikai Hombu Dojo. The club will meet annually in a Seminar to be held in different nation in the world every year. Suginami Aikikai (Aikido group) was established in April, 1987 under the leadership of Shihan Hiroshi Kato, 8th dan, a student of the Founder of Aikido, Morihei Ueshiba. Kato sensei is widely admired as an Aikidoist not only in Japan but also abroad, and there are affiliated dojos in Texas, California, Mexico, Indonesia, and in Holland. Also, headquartered in Houston, Texas is the Shudokan Aikido Association which has 20 affiliated dojos in Texas, Mexico and Florida. All these dojos are affilated with the Suginami Aikikai as branch dojos. Suginami Aikikai has over 80 affiliated dojos worldwide that are under Kato Shihan's guidance. Practice at Suginami Aikikai includes training with the bokken (wooden sword) and jo (staff). The training place is Ogikubo Taiikukan at 3-47-2, Ogikubo, Suginamiku. Go east from the JR station's south entrance and you can reach it within 6-7 minutes by walking. Aikido is a Budo (martial art) created by Morihei Ueshiba. 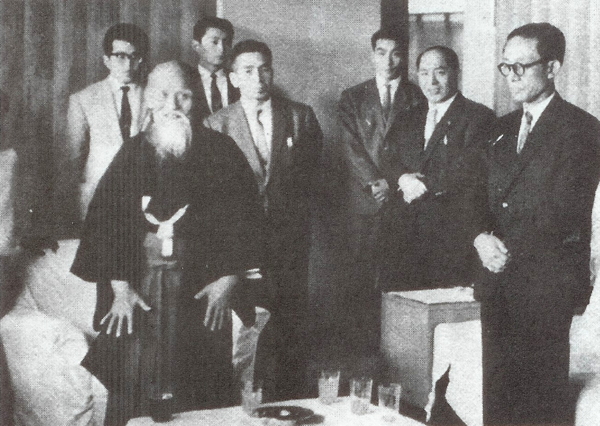 After the Founder's passing in 1969, his son Kisshomaru Ueshiba was inaugurated as Aikido Doshu. At present, Moriteru Ueshiba, grandson of the Founder, has succeeded his father as Aikido Doshu.